Perfect!Ordered the 15′ Dyneema/Polypro suspension system with Beetle Buckles along with my Chameleon 1.6 hexan and loved it so much, I promptly ordered the same with sewn-on Dutch Clips for my Warbonnet Blackbird XLC. Easy set up and simple adjustments but most importantly, I can now store my dew-covered suspension separate from my hammock. InnovativeI got this suspension system plus some continuous loops for a Hennessey hammock. These straps are lighter, longer, and easier than the stock suspension. I recommend this suspension for any hammock though. 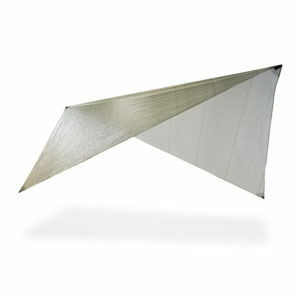 I have used it on 3 different hammocks and it works perfectly. 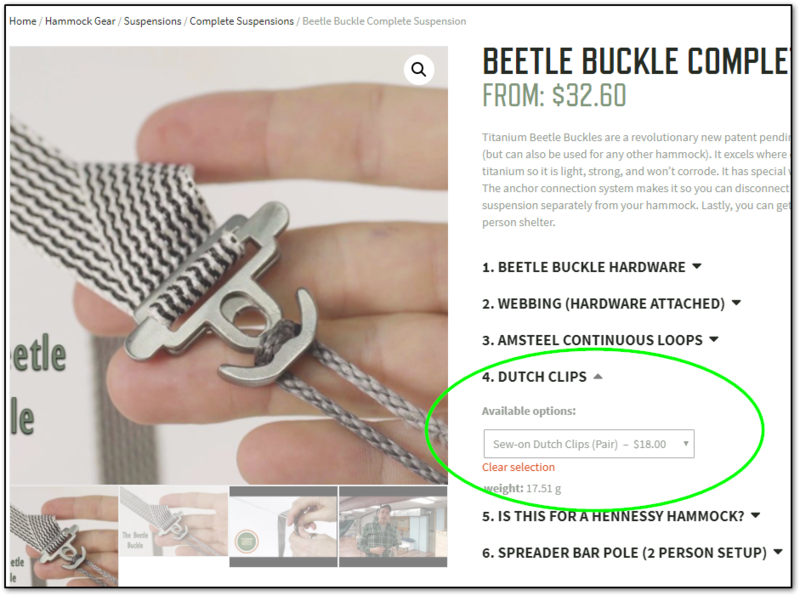 If I elect the ‘Sew-on Dutch Clips’ for the Bettle Buckle and webbing, are do the dutch clips come sown on? Yes, they will be sewn onto the loop on the end of the strap. Can you tell me the difference between polyester, spider/poly and 3000# webbing? New to hammocking I’ve tried woopie sling and UCR even with 10 and 12″ Burrie. After about an hour in the hammock it would just drop. Did it 3 times in one night had to give up and pack it in. The beetle suspension looks like it wouldn’t slip. 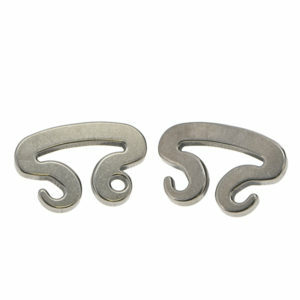 spider/poly would be a good option for you as it will be the lightest option and works very well with buckles. We have no problem with any of these and slipping so it should eliminate that problem for you. The 3000lb straps will be the heaviest and the strongest as they have a breaking strength of 3000lbs. The polyester and the spider/poly both have a breaking strength of 1500lbs and the spider/poly will be the lightest straps available. hey dutch are the 3000 lbs tree straps supposed to be hard to move in the buckles? i just received mine today and i essentially have to separate the buckles completely to get it to move. didn’t know if they are tighter because they are beefier or if im doing something wrong. ive watched the video multiple times and i think im doing the same thing you are but they are really hard to move. thank you. For the dual hammock beetle buckle setup, do you recommend two spreader bars or just one? One spreader bar and at the head only. Can you put 2 beetle buckles on the 15′ Spider/poly? 4 in total. That way I could loop around two trees and hang 2 hammocks off one set of tree straps. If so can I get longer straps than 15′. I do not recommend this and I do recommend that you use separate suspension for each hammock so it will not put unnecessary tension on the straps. Can this be used with the Spider Web? Preferably the 1.5? No it can not be as it will slip. The beetle buckles will work with the spider/poly and the polyester webbing. Sweet suspension, too easyThese are a little heavier /bulkier than my previous system (tree webbing with whoopie hooks on slings), but they are about as good as it gets for making set up and adjustments effortless. Using them with a spreader bar on the double dutch system. Compared to the whoopie slings, one major advantage is if your trees are pretty close together it’s no problem at all, they can tighten all the way; while the slings can only get so close the end because of the loop, you have to have about a foot or so of sling at each end. What happened to the Dyneema/Polypro webbing option & what do you recommend as the next best thing? Thanks! The dyneema/poly webbing is now called the spider/poly webbing and it is the same webbing. In the list of options, next to “Webbing” it says “(Hardware Attached)”. Can you please clarify this? I thought the tree straps just have 1 loop end and 1 plain end, and the hardware just slips on the plain end, and so the hardware is inherently unattached. Just want to make sure I understand this for my purposes. Thanks! We will put the hardware on the straps (the beetle buckles). Straps do only have a loop on one end and huggers have a loop on light on either end. We will sell this with straps not huggers. 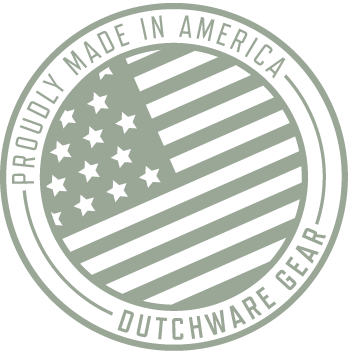 If you have any further questions please email me at sales@dutchwaregear. What do you recommend for a good rain break for this system? I would like to use the buckles for 2 people. What is the maximum weight the actual buckles themselves will hold? 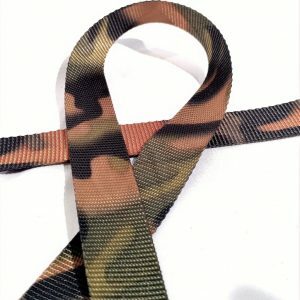 Just curious of the advantage of using Dutch clips over just threading your webbing through the loop on the tree strap? Thinking about ordering this setup for my wife’s hammock to make it easier and wondering if I should add the Dutch clips or not. I’m 6’5″ 260lbs. Would the spider/poly be OK even if I hang a 40-50 pack off my suspension? Would this suspension work with a Grand Trunk Skeeter Beeter Pro? I’m not sure of the dimensions of the cordage used for the suspension of this hammock but it looks massive, unsure if it would work with the beetle buckle hardware. If you are at 270 you should be perfectly fine with the polyester straps and beetle buckle combination. We do stand by our weight rating of 300lbs and I do not think that you will need to go up to the 3000lb webbing. My first order from Dutchware. It won’t be my last. Best customer service experience. Of course I messed up the order but was able to email over the weekend prior to shipment. Little did I know I was actually chatting with Dutch who held the order until Monday. Carolyn double checked the order and fixed everything. Still got the order extremely fast the same week. I wasn’t expecting it after the mess I made. The product works great. Very smooth adjustments with some weight on the hammock. Very light weight. Just tested it out at home, look forward to using it on a section hike on the AT in April. 5 out of 5	How to install amsteel continuous loop to Hennessy Hyperlite Hammock (flat end)? Just received BEETLE BUCKLE COMPLETE SUSPENSION. Would you have a video to show how I should make the captioned conversion? Easy, light, and even a bit stylish – plus the ability to hang two hammocks off the same set of trees. What else could you want in a suspension system? Absolutely love this system. I waited for it to come out and I’m glad I did. Very easy to use. Love how I can take continuous loop off beetle buckle and then store straps and buckle separate from hammock. I like easy and light weight, that’s what this offers. Dutchware made the straps the length I wanted. Great customer service! I love my new beetle buckle suspension for my Hennessy hammock! Not only is it super solid with zero slipping, but it saved me 1 lb by removing the stock suspension, tree straps, caribeaners, and rappel rings. It is easier to use as well. I always used to pull my hammock tight before, and now hang at the prescribed 30 degrees and the Hennessy lays fine that way. Not sure why everyone pulls them so tight. Once again, Dutch hits it out of the park! Love this new system! Super light and strong and very easy adjustments. Just curious. Why does the Hennessey option weigh more? There is a slight difference because the loops for a Hennessey are longer. The beetle buckles I got don’t look like the photo (or video) and I can’t figure out the best way to thread them on the straps. Are you sure you don’t have Cinch bugs. Can you email me a picture? Sales@dutchwaregear.com. I purchased the Beetle buckles with the Dyneema/Poly strap , Dutch clips and Cls . I too converted a HH and am very happy with the results. Lighter weight, super adjustable and fantastically easy setup. Excellent Idea putting this together, perfect form and function. After I received the order confirmation I replied back with a color change request on one of the CLs. They got right on it and helped me out. Big +1 on CS! We love the Beatle Buckle suspension, it makes life so much easier to look for just 2 trees instead of looking for the right combination of 3 or 4 trees, my wife couldn’t be happier (happy wife, happy life). It takes a little getting used to but once you have it figured out, life is great. We use a spreader bar at each end to give a little more room and it works great. Not to mention you can pack the suspension separately which is priceless if you get any sap on the straps, thanks Dutch. What is the occupant weight limit on these? The Beetle Buckles have a weight limit of 300lbs. RE: Diameter of Amsteel continuous loop- 7/64″ vs 1/8″. How should I decide between these two diameter. I am 70kg/155lb. I use a Hennessy Hyperlight Asym Zip Hammock. Either diameter of amsteel will work with the beetle buckle so that is not a problem. The 7/64 amsteel will be rated to hold about 600lbs once you are all set up so that will be plenty for you. Is there an option to include the new Dyneema 2.0 straps with the bundle? No, the Dyneema 2.0 webbing doesn’t work well with buckles. I converted wife’s Hennessy with continuous loops and intend to hang on spreader with my Chameleon. I don’t foresee any problem with that. Why do you ask if system is for a Hennessy Hammock, am I missing something here? 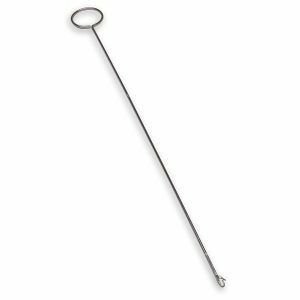 When purchasing continuous loops it is important as you will need a longer length than just the 8″ continuous loop and we will send you a 15″ instead. This is why we ask. The 15′ poly/dyneema strap w/ beetle buckles and Dutch hooks provides a bomb proof suspension system. Detachable, versatile, fast, simple, and very very reliable. Nice work Dutch! 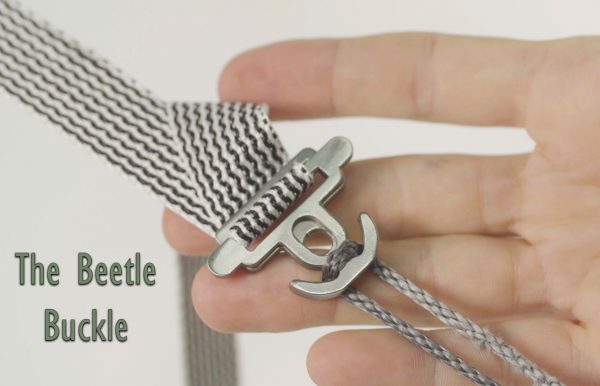 Is is possible to order beetle buckles attached to a different-length polyester strap (say, 6 ft. long)? Is it possible to specify the strap color? Your drop-down menu for this page doesn’t offer many strap options. Yes you could do this however it will not be in the complete suspension package. You will need to purchase the beetle buckle hardware only and then the 6′ straps of your choice. They are not offered in the package but you can still mix and match. Hi Dutch – Can I use these on a Warbonnet RidgeRunner bridge hammock with each side of the apex dog bones attaching to either side of the hooks? Or is it not recommended for a bridge? Yes the beetle buckle will work for this and fits either the 7/64 or 1/8 amsteel well. For the spreader poles, what’s the difference between the sizes? This would be used for me and boyfriend. The .728 will hold more weight than the .665. You should be fine with the .665 as most people are. It will be a pair, so it will be enough to hang one hammock. Just received my beetle buckles from Dutch and i must say I AM IMPRESSED! Such a simple yet well thought out design. Works great with the Dyneema/poly straps. I see there’s a pull down menu for if I’m using a Hennessy Hammock. If I put yes is the product I’m receiving different? I’d like to interchange between my Hennessy and ENO, would that still work? Is there an extra piece sent for the Hennessy?